A major musical celebration is coming to Doylestown, Pennsylvania's historic Highland Farm this July. 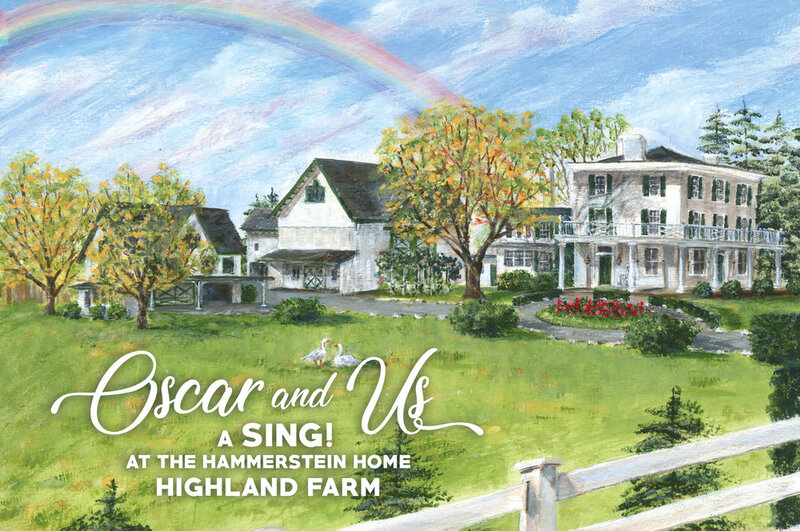 In conjunction with Doylestown Township’s bicentennial celebration, and coinciding with Oscar Hammerstein II’s 123rd birthday, song leader Jessie Barth and Open Sky Founder Lori Rosolowsky will present a multi-generational sing-along celebrating the lyricist’s most treasured songs: Oscar & Us. This SING!, which is free and open to the public, will feature several notable guests, including Arun Gandhi, Mahatma Gandhi’s grandson, and Julie Henning, who lived with Pearl Buck as her adopted daughter. Oscar Hammerstein II was one of the twentieth century’s most influential lyricists, and his collaborations with composer Richard Rodgers include some of the most successful musicals in the history of the American theatre—including The Sound of Music, South Pacific, The King and I, and Carousel. In 1940, three years before the Broadway debut of Oklahoma!, he purchased Highland Farm on East Road in Doylestown, and he lived there with his family until his passing in 1960. The residence was added to the National Register of Historic Places in 1988. Mr. Hammerstein is one of Doylestown’s many notable residents who have made profound humanitarian and artistic contributions. For information on the township bicentennial, visit www.doylestownpa.org. This event is presented in partnership with the Doylestown Township Bicentennial Committee, Open Sky Artists, and friends of the Hammerstein Museum and Theatre Education Center. Your financial support allows us to introduce a new generation to the joy and impact of Oscar’s life and music, and it will help to underwrite the considerable production and performance costs of the SING! events. No amount is too small. We have a unique and wide-ranging array of sponsorship perks for contributors of all levels. The total value of your contribution entitles you to these sponsorship perks. Check them out below!